Specifications: 256mm (10.1in diagonal) LCD tablet with 1.5GHz, dual core CPU; 1G RAM; Quad band GPRS, Tri-band HPSA + LTE; 32G internal memory (28G available) + microSD card slot (32G maximum); 250mm (9.87in) x 178mm (7in) x 13mm (0.5in); 750g (26.5oz). Full specifications can be found here. Yet another non-standard charging/sync port. 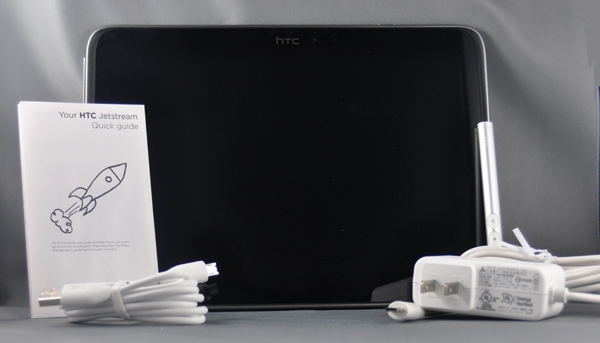 Summary: In October 2011, with much fanfare, Rogers announced the availability of the HTC Jetstream (aka the HTC P715a) -- Canada's first LTE-capable tablet. Even though the LTE network is limited to three cities in Canada (Montreal, Toronto and Vancouver) we were able to get one of the preview units and play with it for a week in Victoria and Vancouver! So, does an LTE-equipped tablet run circles around mere 3G/H models? The results were surprising. During a quiet evening at home, my wife and I spend quite a bit of time on the internet. She uses her laptop to check out emails, work on spreadsheets and documents for various volunteer groups, and plays crosswords, Soduku and poker. I mostly check emails and the news on my smartphone. Her laptop is getting old and finicky, so I was thinking a tablet might be a great solution for both of us -- she to get something lighter, more portable, and instant-on (no more waiting for it to boot up) and me to get more screen landscape to work with. When Rogers' PR firm contacted us with an offer of an HTC Jetstream to review for a week, I thought this was the perfect opportunity to test out a state-of-the-art unit and see how it would work for us. We were both really excited about the possibilities, even though we wouldn't be able to test out the 'blazing' LTE speeds at our home in Victoria. Fortunately (for me) I also work in Vancouver during the week, so it was no problem to take it over the water for a couple of days to give it a high-speed spin. The tablet arrived a couple of days later via courier, and I have to admit I was a bit surprised at the plainness of the packaging. 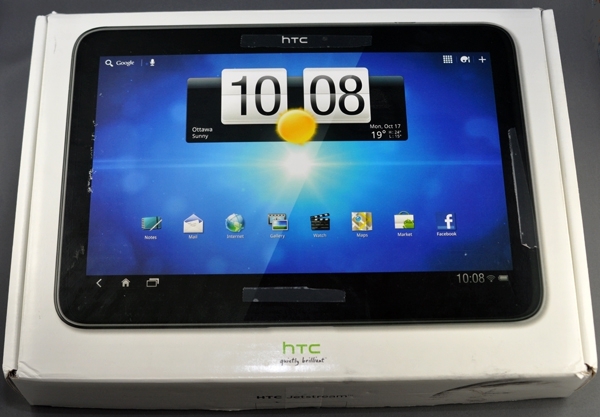 It came in a simple white cardboard box with a picture of the tablet on the top. 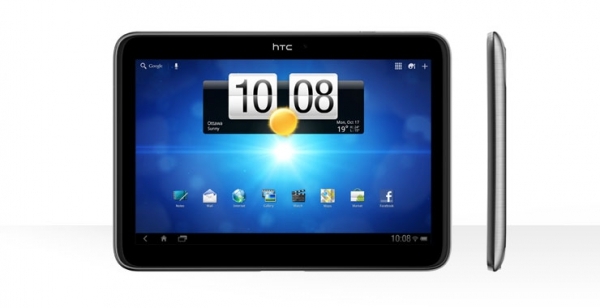 Usually HTC is a little more flashy than this but, hey, the important thing is the tablet, right? Figure 1: This is the box the Jetstream arrived in. There are a couple of crumples around the edges due to this being a review-loaner unit but, overall, it's pretty plain. Inside the box comes the usual assortment of accessories we see for most smartphones -- quickstart guide, wall charger, and sync cable. Interesting that there were no earphones included. Figure 2: Here's what comes inside the box. No, I didn't take this picture with the colour turned off. Maybe in some sort of homage to Apple, everything is pretty monochromatic. Clockwise from the bottom left you see the USB cable, the Quick guide, the Jetstream tablet in the centre, a stylus which I assume is the HTC Scribe (TM) digital pen, and the wall charger. What was more intriguing was that they included a stylus. I haven't seen one of those in years, and I kind of wondered why you would want to use one with a tablet. According to the marketing brochure, this is a digital pen that you can use to "...sketch, highlight, take notes and more right on your tablet..." Hmmm, must have missed something somewhere since I didn't see any software that specifically took advantage of this capability.